Our weekly options strategy focuses on weekly option call and put trading opportunities throughout the month. This strategy is designed for option traders with moderate to advanced experience trading options. The monthly options trading strategy focuses on call options once a month. This strategy works for option traders of all skill levels and provides members with the most consistent profit. Our target profit has been determined from our extensive trade history and trade statistics. 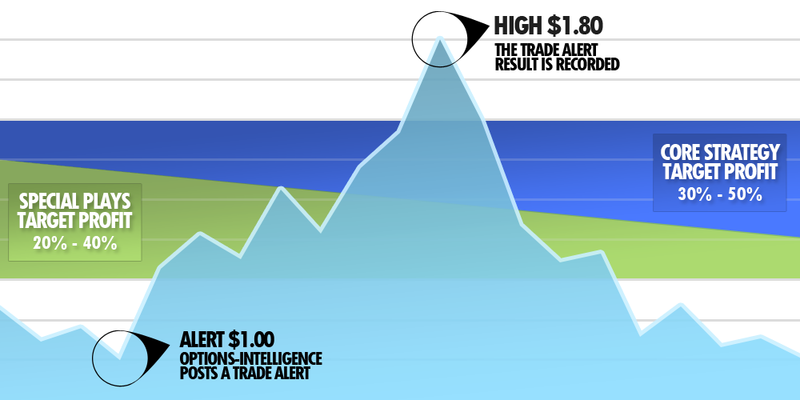 To record our results, we compare the entry price to the high price of each trade alert. Using this method, we have recorded the result of 3666 option trades and created specific target profit ranges for our option alerts based on the strategy used. Members are also able to use our extensive trade history to see winning history for individual stocks at a specified return. This unique feature enables option traders to dial in on a desired risk/reward scenario that suits their own trading style. Make a 50% return or better from our option trades by following our profit targets. 20 years of options trading in all markets. No other trading service compares to our trade statistics. Free text message notifications and real time option trade alerts through Twitter (@optionsintel). Get our alerts delayed by one hour, sign up for a free 30 day trial. Closed for US market holidays. Our other service, One Day Wonder Options focuses on weekly option picks only. Get up to 3 weekly option plays every Friday. Make up to triple digit returns and mitigate risk with small allotments. As an informed investor you should be aware of the risks associated with options trading. Options-Intelligence is a registered trademark of Easy Trade of Southwest Florida. All content © 2019 Easy Trade of Southwest Florida.